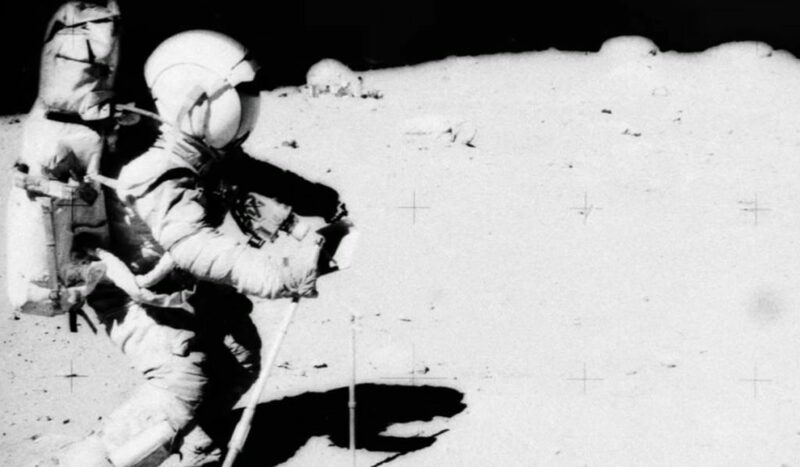 Conspiracy theorists have long argued that the details surrounding the moon landing were obscured, and many have pointed to a recently analyzed photo as potential proof of that fact. While there’s a mountain of evidence that confirms that we have, in fact, made forays into space and have walked on the moon, there’s a committed group of people who believe – for one reason or another – that we never walked on the lunar surface. Others believe that while we made it to the moon, the government took steps to cover up evidence of alien civilization. Supposed un-doctored imagery from the Apollo 16 mission has been making the rounds online that many say is proof that there is truly either an alien population on the moon or that the whole thing was faked due to the existence of structures and “people” in the background of the image. The video regarding the images was posted by the YouTube channel UFOmania and analyzes an image obtained from the NASA archives. We’ve included the video below so you can decide for yourself whether this evidence is enough to suggest that the moon landing never occurred or that details surrounding the moon landing were adjusted as to not inform the public of the existence of alien life. Commenters on the video generally seemed convinced, offering suggestions such as how the moon landing might have been filmed in a remote location that was adjusted to look like the moon, and others more comically suggesting that the object could be Darth Vader’s house. It’s true that the image in the video looks an awful lot like a normal rock, but many people who deny that the moon landing ever occurred are looking for more evidence to back up their claims. There’s something to be said for seeing what you want to see, as many people have pointed out that the supposed alien structures are nothing but average terrain, but the images are certainly blurry enough to suggest that there could be something there. Overall, there seems to be a mountain of evidence to support the fact that we have, indeed, launched into space and that the moon landing was real. The evidence for the contrary is thin at best, although many believe this video may be enough to confirm that the details surrounding the moon landing are shady – if not outright fake. It’s up to the viewer to decide whether these images are legitimate enough to take as evidence, or whether the blurry quality renders them basically unusable.